TOYO Corporation has been engineering and marketing a number of test solutions to serve the liquid crystal display (LCD) industry for some time now. The new LT1000 represents the next generation in the evolution of this product line and the culmination of over twenty years of liquid crystal display measurement research and development work carried out by TOYO’s engineering teams. 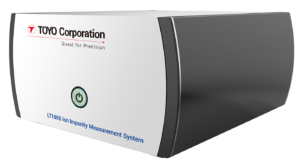 It is an ion impurity measurement system that provides a new and innovative method to characterize and measure ion impurity levels in liquid substances. And the patent-pendingsystem is the first measurement solution of its kind to measure both organic and inorganic ions. Conventional measurement solutions of this class are based on a chemical analysis approach and as such are designed to mainly measure impurity (not ions) and inorganic ion impurity. The LT1000 can detect both organic and inorganic ion impurity with extremely high sensitivity in the ppt (parts per trillion)range. Additionally, the LT1000 is extremely sensitive when measuring ion concentrations. It detects even the most minute (in the parts per trillion (ppt) range) of ion concentrations in a substance. With more sensitivity and greater accuracy, there is less concern about getting a sub-optimal reading and more focus on achieving the optimal result. The high resolution and accuracy provide an ability for lab engineers and technicians to detect impurities in test materials which is unmatched in the industry. Compared with other products in a similar class, the LT1000 can perform and complete a full test cycle in a second compared to conventional ion chromatography methods, which can take upwards of one hour. This is on the order of more than 3,600 times faster allowing for a substantially larger number of tests to be performed over a given period of time. This accelerates lab analysis and helps shorten project development lead times.